The present study was mainly conducted to explore the effect of the computer’s Answer-Until-Correct (AUC) vs. computer’s Knowledge-of-Result (KR) task feedback on children's speech use (compulsory-interaction), manifested innerinteraction, task performance and satisfaction during learning tasks with forty preschool children. The effect was explored through a special computer-based methodology that completely relied on special Digital-Playground®. The Digital- Playground® was essentially used to control the entire experiment without any sign of Human-Human-Interaction (HHI) either before, during, or after the progression. Technically, no instructor, teacher, parents, experimenter, caregiver, or any other human's external regulator was engaged as no previous training was offering to the young users on how to use the environment or what should they do either before, during, or after the experiment. It was hypothesized that the effect of computer's AUC on the young users' interaction behavioral development will outperform computer's KR in the verbalization intensity (compulsory-interaction), manifested self-regulation (inner-interaction), and the degree of satisfaction. Despite the results were not confirmed the hypothesis, the results generated by the game were consistent with the statistical results in which this consistency increases, to a great extent, the reliability of the interaction measurements used in the present study. However, the results were not confirmed Vygotsky’s view or Piaget’s view of self-regulation (inner-interaction) development as the results concluded that thinking aloud (spontaneous-interaction) and self-regulation (inner-interaction) have a reverse relationship. Therefore, thinking aloud (spontaneous-interaction), per se, can be used to explore various and different problems that the young users may not agree to talk about. Importantly, the main message that we aimed to send to each single researcher including us, is to stop using different English terminologies to describe the same phenomenon because this will not lead to a real revolution to help our children. The notion that interactions between teachers and learners is fundamental to the education experience is not new, and nor should it be. Research shows that such interactions differ between when slate and chalk is the primary interaction technology and when the digitized tools of online environments, diverse differences among such interactions have been reported in the literature . Dewey [2,3] described interaction as a component of the educational process where a transformation of the inert knowledge or information occurs, in terms of the transactional view where human factors and the environment are both taken into consideration. Interaction is a complex concept and has been deemed as one of the important ingredients in all forms of education, regardless of whether technology is involved. Interaction in traditional classroom learning focuses on the dialogues between instructors and students. Nowadays, the researchers in Human-Media Interaction (HMI), on one hand, believed that the participants, or young users as the most recent research in HMI calls [4,5], display when they are listening various behaviors in response to the contributions conversation of the speaker . They signal that the contribution is being attended to, understood, and agreed upon or some other attitudinal or affective reaction to it [7-9]. This dependence of the occurrence of a listener response on the contribution of the speaker has prompted many studies in HMI on the characteristics of the speaker’s contribution that might act as cues or triggers for the responses both from a linguistic perspective  and from a computational perspective. However, the researchers in HMI have no real understanding yet of the causes of these differences . Therefore, the assumption behind these studies is that listener responses do not occur randomly, or at the listeners’ whims but, instead, there is some kind of dependence on the speaker’s contribution. As reported by Heylen et al. , the hope is to find out algorithms that can produce appropriate responses in spoken dialogue systems or embodied conversational agents based on features derived from the speaker’s contribution. On the other hand, the researchers in studying children's behavioral development are guided either by Vygotsky [12-17] or Piaget [18-20]. However, the literature still lacks, to a great extent, the research concerning the effect of the task feedback on young users' interaction behavioral development especially when the external regulator is computer. Thus, the present study was mainly conducted to explore the effect of the computer’s task feedback of the Answer Until-Correct (AUC) versus computer's task feedback Knowledge-of-Result (KR) on young users' interaction behavioral development when they talk and think while acting alone during progression. To our knowledge, this subject has not been explored yet in the literature. The present study, however, is completely relied on the studies that originally introduced by Agina and her colleagues [e.g., 21-33] and considered as an extension. For the sake of the clarity and simplicity, the term Aginian's studies will be used to refer to the studies by Agina and her colleagues [e.g., 21-33] whenever it is necessary. The integrated approach proposed by Swan  and Garrison and Cleveland-Innes  is dependent on establishing the equivalency of the types of interaction with the types of presence. This means that social presence may be equated with learner interactions; cognitive presence may be interpreted through content interactions; and teacher presence can be depicted by teacher interactions. This equivalency is itself dependent on the nature and quality of the interactions themselves. Ensuring a certain quantity of interaction in itself is not enough. It is in the quality and appropriateness of the nature of interactions— interactions conducted purposefully for learning—that each type can be equated to cognitive, social and teaching presence respectively, as acknowledged by Swan . Garrison and Cleveland-Innes  claim that the quality of interactions can be determined by the extent to which they influence thinking as critical and reflective in its practice, rather than surface level exchanges of information. As such, quality interactions must be structured, directed and purposeful, involving a depth of engagement with both the content and other actors in the learning environment, if the interactions are to be meaningful for the learning. Ideally, interaction would be required to confirm understanding. However, students may be cognitively present while not interacting or engaged overtly . Agina et al. [4,5] were the first who classified interaction into four main types based on the participants' reaction when they act alone without any sign of Human-Human-Interaction (HHI) either before, during or after progression. They clarified that the interaction, by nature, is diversity and variable from one user to another. The diversity of the interaction behavioral development is varying from innerinteraction, compulsory-interaction, undesirable-interaction and spontaneous-interaction in which each one has a different mechanism (i.e., how it occurs? ), how it works, how can it be distinguished and differentiated? They defined the compulsoryinteraction as the task-related speech, undesirable-interaction as the task-unrelated speech, spontaneous-interaction as "the participants' spontaneous verbal-thinking about the current task when they act alone and without HHI either before, during, or after the progression" and inner-interaction as "the participants' nonverbal-thinking about the current task when they act alone and without HHI either before, during, or after the progression". They also clarified how those four types are different in their mechanism (how it occurs and how it works?). Learner-instructor interaction refers to a two-way communication between the instructor and learners . In terms of interaction, this type of interaction is regarded as valuable by students and by many instructors. Learner-instructor interaction can take on many forms. Some of them are indirect, such as instructors designing a course to stimulate student interest in course content or increase motivation to learn. Evaluation is conducted by instructors to make sure learners are on track, and certain assistance such as guidance, support and encouragement is available from instructors when necessary. Instructors are especially valuable when students are at the point of knowledge application . In this type of interaction, the task feedback is important. Based on the students' task feedback, instructors can ensure that student comprehension of subject matter, the given materials and receive information on their own performance in delivering content. The instructor's task feedback is vital to students’ achievement in the courses [38,39]. Students favor timely feedback from instructors. In contrast, a lack of immediate feedback brings about feelings of isolation and dissatisfaction [40,41]. Northrup et al. confirmed the importance of instructor task feedback to students and found it effective when provided as little as two times per week. Students who can easily communicate with their instructors are more satisfied with the learning compared to those having difficulties interacting with their instructors . However, the researchers in studying children's behavioral development [e.g., 13-18,20] with many others including Aginian's studies, still consider the learner-instructor interaction during progression as task-related speech (i.e., compulsoryinteraction) or task-unrelated speech (undesirable-interaction) depends on the verbalization itself. Compared to any other type of interaction, learner-content interaction is more abstract. According to Moore , learnercontent interaction refers to a one way process of learners elaborating and reflecting on the subject matter or the content. Learners have to construct their own knowledge through a process of accommodating new information into previously existing cognitive structures. Changes to their cognitive structures then lead to changes in understanding and perspectives. The interaction of learners with the content initiates an internal didactic conversation. This interaction happens when learners talk or think to themselves about the information, knowledge, or ideas gained as part of a course experience. Through an internal conversation, learners cognitively elaborate, organize, and reflect on the new knowledge they have obtained by integrating previous knowledge. This process of intellectually interacting with content is a required process for education [36,37]. In HMI [e.g.,4,5], this conversation may be spontaneousinteraction or inner-interaction depends on how it occurs (i.e., it's mechanism). As clarified by Agina et al. [e.g.,4,5], if the learner is spontaneously verbalizing the interaction, the result will be spontaneous-interaction; otherwise, the interaction will be inner-interaction. They also clarified that the term self-regulation and inner-interaction are two names of the same phenomenon. From Tuovinen’s perspective , media can be classified into five categories: sound, text, graphic, video, and virtual reality. He argued that the combinations of sound with other media are less likely to produce cognitive overload in that sound and visual images are processed by different parts of the brain . Mason and Kaye  also indicated the vital role that learner-content interaction plays, and that for effective learning to occur, learners should consciously interact with or operate on the learning materials or resources (i.e., inner-interaction). Learner-content interaction is critical not only in terms of a learner’s knowledge constructions, but plays an integral role in all forms of interaction. Learner-instructor interaction enhances the young users' interaction with content (both spontaneous- and inner-interaction) in which learner-content interaction interplays with leaner-instructor interaction (compulsory- and undesirableinteraction) and learner-learner interaction and then jointly influences learning outcomes . Learner-content interaction is considered a good predictor, sometimes as the best predictor, of student satisfaction. It seems that there is no conclusive result as to which type of the three interactions best predicts student satisfaction [48,49]. Thus, in terms of young users' behavioral development, the learner-content interaction, by nature, involves both spontaneous-interaction and inner-interaction. In the literature, many types of task feedback have been investigated (for extensive details see the Power of Feedback) . The most common types are Knowledge-of-Performance (KP), e.g., ‘‘you solved 90% of the problems correctly’’, Knowledge-of-Result/Response (KR), i.e., ‘‘your answer is correct/ incorrect’’, knowledge-of-Correct-Response (KCR), i.e., provides the correct answer to the given task, Answer-Until- Correct (AUC), i.e., providing KR and offers the opportunity of further tries with the same task until the task is answered correctly, Multiple-Try-Feedback (MTF) provides KR and offers the opportunity of a limited number of further tries with the same task, and Elaborated-Feedback (EF) provides additional information besides KR or KCR. However, the question of whether young users are able to assimilate or even to understand the meaning of these types of feedback remains challenged (Aginian's studies). Therefore, given the fact that the interaction, by nature, is diversity and variable [4,5], the literature has no clear answer yet about the effect of task feedback on young users' interaction behavioral development and how can those types of task feedback be applied with young users, especially at an early age, during progression. Some studies [e.g.,51] concluded that if a child, on one hand, completes a task simply to receive a grade and the grade is not what he thought it should be, then he will be disappointed and provide less effort in the future. On the other hand, a child who completes a task to satisfy his curiosity and receives an average grade will provide more effort in the future to quench his curiosity or master a skill. However, numerous studies have ranged from extremely positive, through no effect, to strong negative effects and the feedback sign (positive/negative) does not explain the large variance in the effects . The present study is an extension of the study produced by Agina and her colleagues  to explore the effect of computer's task feedback on young users' interaction behavioral development. As reported by Agina et al. [27-29], researchers, up to date, still continue to support their participants with explicit instructions during learning tasks to think and talk aloud and prompt them when they are silent for long periods to produce more private speech (i.e. task-related speech or compulsory-interaction as recently reported [4,5]). This practice is not recommended, as it places artificial constraints on the situation, changes the cognitive processes and task activities required, and distorts the natural spontaneous emergence of both compulsory-interaction and spontaneous-interaction, which is usually the desired behavior under study despite the previous researchers [e.g.,53] did not mention any thing about interaction! To be sure that the subjects actually report their mental states without distorting them, it is important that each subject does not feel that he is taking part in a social interaction between himself and the external regulators (i.e., undesirable-interaction). This sense should be avoided or, at least, reduced to a minimum . However, there is another cause for concern: if the subject is silent for a long time, the verbalization obtained becomes useless because significant parts of the cognitive process may not be investigated and might change the actual information to some extent [27-29]. In addition, emotional and motivational factors can also produce a cognitive process different from the one that would take place without thinking aloud. The researchers usually tried to sidestep this problem by reminding the subject to think aloud . However, this ‘‘thinking aloud’’—as a method of eliciting data—is not the same as ‘‘thinking aloud’’ in the everyday sense, which entails something other than sitting people down next to tape recorder and asking them to talk . Stated differently, the participants who were asked to think aloud, as part of a research method, will not talk to themselves spontaneously but instead, talk to themselves because they have been instructed to do so [27-29],which is compulsory-interaction that already versus spontaneous-interaction [4,5]. Therefore, the presence of another person, as an external regulator, creates the problem of separating the verbalization of social speech (i.e., task-unrelated or undesirable-interaction) from private speech (task-related or compulsory-interaction) as reported by Fuson  and deeply clarified by Agina et al. [4,5]. skill development [61-63]. Some researchers [e.g., 64] believed that games are most successful at attracting learners when they have clear, pre-established rules that encourage gradual advancement to high levels of complexity, and when they provide immediate feedback that supports a sense of player satisfaction and achievement. Nowadays, the literature involves an extensive and massive body of research concerning DGBL in many various and different directions such as the impact of computer use on children , implementation of design-based learning through creation educational computer games , evaluate GBL , and many different and various topics. However, since the time of the seminal research regarding the young users' interaction and development by the two paradoxical researchers Vygotsky (1920s) and Piaget (1950s), the methodology used with the young users remains the same despite the difference in the experimental design, results, and final outcomes (Aginian's studies). Despite the ubiquity and notoriety of the Vygotskian's and Piagetian's perspectives, they have received little or no attention as a criticize research given the fact that the computer nowadays, as a technology, is not like hundred years ago and, therefore, children, themselves, are different generation because of the modern schools, sophisticated educational systems, TV channels, video games, toys and tools, parents' educational level and so on [26,33]. Nevertheless, the current research in the literature still follows either Vygotsky or Piaget with no major change that may lead to a real revolution. That is because of the use of the same methodology in terms of experimental design. Remarkably, the literature, up to data, involves a huge body of research efforts that have been spent especially in the last 10 years in the area of adaptive learning systems and a variety of methods that have been proposed to build learner models and DGBL, which allow a system to personalise its interaction to individual learners . A recent review paper on the subject of learner modeling  outlines the different approaches for learner modelling used in the last decade. Importantly, despite the interface design has always considering as one of the essential elements for building a coherent and consistent learning object, it is still believed that interface design relates only to providing an aesthetic appearance to the learning object. From an interaction point of view, the interface should be seen as the action space where mediatic objects are presented for user interaction . Psychologically, the “fashion and stylish” interface of DGBL does not mean the product will be definitely accepted especially by the young users at an early age when the gender, just for instance, has conducted as an independent key . Many and many experiments and tools were failed because of the adult-based design as many others failed because of the difference between the game's hero gender and the young user's gender . Cognitively, the methodology used in the literature so far, especially with young users, has to consider the negative effect of the Children's Split Attention (CSA) as well as the Children's Cognitive Overload (CCO) before, during, and after progression. Thus, the current study uses a novel methodology that already came up with different results and outcomes, which was used by Agina and her colleagues in their studies (Aginain's studies). Why should be the Present Study take place? To date, the previous work still relies on human's external regulation (i.e., teacher, instructor, experimenter … etc.) as an external guidance/regulator before, during, and after the progression [4,5,27-29]. Therefore, the previous work relied on HHI to offer the training on how to use the stimulus material before the actual experiment starts. In terms of HMI, however, no study yet tries to analyzing the effect of the computer, as an external regulator, on young users' interaction behavioral development especially when they act alone in an isolated computer-based environment (Digital-Playground.). Thus, the present study is twofold. First, it is an actual extension of the studies introduced by Agina et al. [4,5,27] to explore the effect of the computer's task feedback on young users interaction behavioral development. Second, it is a reformulation of the study introduced by Agina et al. in terms of HMI. This is mainly to send a message to each single researcher to stop play with English terminologies if the researchers, including us, really want to make a revolution regarding our children's behavioral development. For instance, what difference it makes when you use private speech, task-related speech, or compulsory-interaction; what difference it makes when you use self-regulation or inner-interaction and what difference it makes when you use thinking-aloud or spontaneous-interaction. Is this really leading or even help to a revolution?!!! Expectation (1): The computer’s AUC is more stimulated for the young users' overall performance than the computer’s KR. Question (1): What is the influence of the computer’s AUC vs. KR task feedback on the young users' overall performance? Expectation (2): The computer’s AUC is more stimulated for young users' verbalization than the computer’s KR. Question (2): What is the influence of the computer’s AUC vs. KR task feedback on the young users' verbalization? Expectation (3): The computer’s AUC is more stimulated for young users’ inner-interaction than the computer’s KR. Question (3): What is the influence of the computer’s AUC vs. computer's KR task feedback on the young users’ innerinteraction? Expectation (4): There is a significant difference between the effects of the computer’s AUC vs. computer’s KR on young users’ interaction during progression. Question (4): To what extent does the computer's task feedback, as an instrument, increase young users' interaction during progression? In the present study, we attempted towards understanding the young users' interaction behavioral development through exploring the effect of the computer's AUC vs. computer's KR on young users' during progression. The affect was exploring through special computer-based methodology that uses special Digital-Playground® (Aginian's studies). To our knowledge so far, this kind of methodology has never been used before for studying the effect of the computer's task feedback on young users' interaction behavioral development. It is very important to mention that the present study used and followed the same experimental design, material, participants, tasks, experimental conditions, procedure, and results that basically developed and used by Aginian's studies. This is mainly to analyzing the young users' interaction behavior development in two different directions. The first direction is to analyzing the young users' interaction behavioral developmental (how does the interaction occur?). Second, clarifying the mechanism of the interaction (how does the interaction work?). The two directions were analyzed through two different conditions in which each condition was acted by different computer's task feedback (computer's AUC vs. computer's KR), which is a topic, for our knowledge so far, has never introduced yet in terms HMI. The participants were 40 students (Mage = 5.4 years) from Al- Nosour preschool, which is one of the public preschools at the center of Tripoli. The teachers distributed the young users into two equivalent groups (AUC-Condition vs. KR-Condition). Each group involved 20 students (10 boys and 10 girls). All young users spoke Libyan as their native language, which is a hybrid of Arabic and Italian and was also the language used by the Digital- Playground®. The school medical records were revised for all the participants to mainly ensure that there is no sign for attention deficit hyperactivity disorder (ADHD) or similar challenges such as the autism spectrum disorders (ASD) or problems with hearing or vision such as color blindness. The use of computer is so familiar among the young users at school and home alike. The participants' parents provided written consent for any data provided by their children to be used in the current and future research studies. The Digital-Playground® (version 1.2) was specifically implemented by the first author to act as a Game-based Learning (GBL) and presented as an isolated environment. The Digital-Playground®, unlike the others, does not require the young user to have any previous training and simultaneously prevents the intervention of human external regulators before, during, or after progression (i.e., no sign of HHI). The Digital-Playground® was speci?cally implemented for investigating the use of the computer as a nonhuman external regulator with young users through different independent variables. In total, twenty (20) tasks were selected among the developed tasks in close cooperation with various preschool teachers based upon the young users' daily classroom activities. The tasks were also evaluated by a number of children through a pilot investigation that involved 103 young users and eventually revised by experts in teaching in many preschools. The tasks were a collection of puzzles, numbers matching, social activates and picture-arrangement (Figure 1). 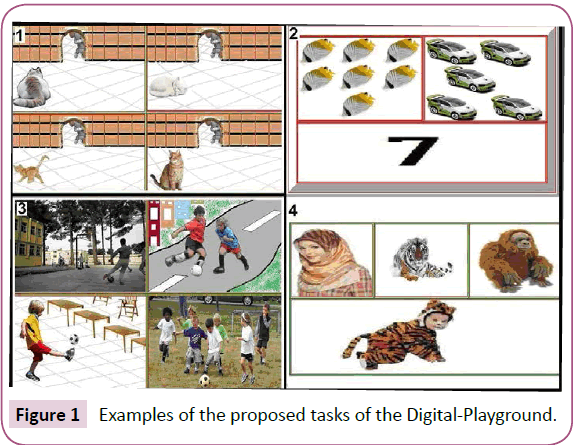 Figure 1: Examples of the proposed tasks of the Digital-Playground. In the present study, we used the Digital-Playground® version 1.2® . It involves two different instructional units of task feedback (AUC vs. KR) in which each of which acted on a different way. The AUC was applied by informing the student to think again about the answer because the current answer is incorrect. The KR was applied by informing the student whether the answer is correct or incorrect without allowing the young user to make more attempts. One of the most practical feature of the Aginian’s computerized methodology (Aginian's studies) is that it enabled the Vygotskyian principle [71,72] of the Zone of Proximal Development (ZPD), that says "children’s private speech (i.e., compulsory-interaction) only occurs when the task is located within the range of their ability and will be less frequent or absent when the task is too dif?cult", to be practically applied with young users at an early age when they acting alone and without any sign of HHI before, during or after progression. This was done through a new concept of the Zone of Users’ Interaction (ZUI), which is de?ned as ‘‘the gap between self-interacted learner and the need to be interacted to learn’’. In speci?c, the tasks of the Digital-Playground® were selected based on the ZPD (simple and dif?cult) and ordered to be presented to the young users based on the ZUI (motivated vs. unmotivated task to interact) in which the young users became able to face the dif?cult tasks without seeking any help from human external regulator, which was considered in the previous work as one of the main complexity of self-regulation/innerinteraction. Accordingly, some tasks were identi?ed as requiring little self-interaction despite the fact that they were classi?ed as complex tasks (see pictures 1 and 3 in Figure 1), and other tasks, despite being classi?ed as simple (see pictures 2 and 4 at Figure 1), required the young user to be more self-interacted to interact with progression in which the young users were avoided to seek help from the external regulators to understand the structure of the tasks during the actual experiment and, simultaneously, enabled the Digital-Playground® to act as a standalone GBL environment. The progression of the game was based on two conceptual concepts. First, the teachers selected the tasks based on Vygotsky’s ZPD and, second, they ordered the tasks based on the Aginian’s ZUI (see once again Figure 1). Because no previous training was offered, as an effort to avoid any external interaction before the experiment, the Digital-Playground® began with the instruction ‘‘Touch the correct sign with your ?nger to start the game’’ spoken ?rst by the animated Princess and repeated by the animated Superman on a continual loop for five minutes or until the user reacted (Figure 2). If the young user did not react within 5 minutes, he ended the experiment by himself (privacy respect). Figure 2: The young user decides to start the game without external regulation. An animated and musical introduction then prepared the young user to interact (Figure 3) and introduced the main stimuli of the game (Princess, Superman, time-line allotment and the bell, which was used by Superman to tell the child that the time allotted for the task had ended). Figure 3: Prepare the young user to interact. After the young user entered as shown in Figure (2) and became aware about the main stimuli of the game as shown in Figure (3), the game introduced two additional simple tasks (Figure 4) related to the young user’s gender (‘‘If you are a boy, touch the boy’s picture, and if you are a girl, touch the girl’s picture’’) and young user’s favorite color (‘‘touch your favorite color’’) without mentioning the statement ‘‘with your ?nger’’ to ensure that the young user was perfectly able to point to the correct item using his ?nger and to warn the young user to pay attention to the task allotment time. Figure 4: Ensuring the activation of the young user's innerinteraction. Prepare the young user to interact. The young user had had to react to each task within only one minute; otherwise, the young user ended the experiment indicated that the experimenter should replace this young user by another one. Stated differently, the young user had had to ensure his interaction with his full free-will by reacting to the two ‘easy-to-answer’ tasks regardless the task precision (correct/incorrect). The allotment time "one minute" is the time usually given by the teachers in the classroom for each child to react; otherwise, the teacher interfered. Technically, this intervention means that the young user, for one reason or another, ended his participation by himself in which the Digital-Playground® was applied that by ending the session. The game allowed the young users 60 seconds to choose the task level (more simple/dif?cult) and another 60 seconds to answer the task itself. This is the regular time given by the teachers at the school to the young users to act/react and the game followed the same behavior to avoid children to bother because of the time. Before each task, the Princess asked the young users to select (i.e., make a decision) about the next task level (more simple/dif?cult). Technically, the game introduced two boards at the middle of the screen while the Princess verbalized: ‘‘Touch the green board for the easier task or the yellow board for the more dif?cult task’’ as shown in Figure (5). Figure 5: The young user's decision about the next task level with their free-will. The following experimental design is basically introduced by Agina et al. . In the present study, we added the necessary research design in terms of HMI based on Agina et al. [4,5]. The validity and reliability of all measurements were achieved during a pilot study with 103 young users with more than 25 experienced teachers prior to this project. Technically, during the AUC-Condition the computer, through the Princess, read the task while Superman informed the young user about the current status of his answer ‘‘your answer is correct" or "your answer is incorrect’’. If the young user’s answer was correct, the game moved to the next task level selection and allowed the young user 60 seconds to choose the next task level (more simple/difficult) as shown in Figure (5). If the young user’s answer was incorrect, the computer, through Superman, warned the young user that he should think about the correct answer once again ‘‘your answer is incorrect. Think again’’ and continue until the young user answered the task correctly or Superman ended the task by ringing the ball because of the task allotment time to answer was over (i.e., the 60 seconds to answer the task was over). Simultaneously, the Princess turned back as a sign of ‘dissatisfaction’ about the young user’s reaction, which was an attempt to motivate the young users’ inner-interaction and to verbalize their interaction loudly (Figure 6). 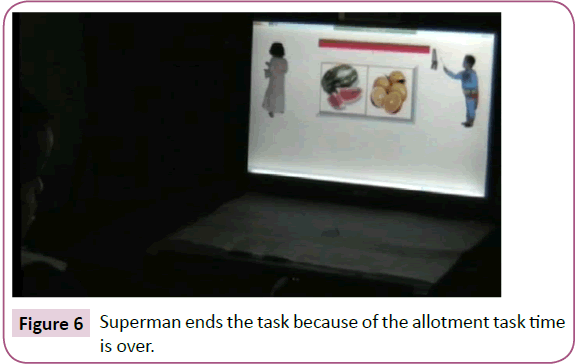 Figure 6: Superman ends the task because of the allotment task time is over. The Digital-Playground®, however, did not warn the young user about the remaining of the task allotment time. This is mainly to avoid distorting the young user’s cognitive process during progression and, therefore, monitoring the learning process simultaneously with the performance is one of the main selfregulation (inner-interaction) characteristics in the Aginian’s studies. Instead, when the task allotment time was over, the Digital-Playground® introduced the next task level selection (Figure 5) and, simultaneously, the Princess asked the young user to choose the task level and then started the actual task. In contrast, during the KR-Condition, the Princess read the task and the Superman informed the young user about the status of his answer ‘‘your answer is correct/incorrect’’ instantly after the young user first attempt to answer and, instantly, the Digital- Playground® introduced the next task level selection (Figure 5) and the Princess asked the young user to choose the task level and then started the actual task until the end of the experiment. In the present study, we used the same scoring system that originally developed in Aginian's studies. Specifically, after each task during the progression, the young users had have to make a decision whether they wanted to proceed next with a more simple task by touching the letter “ ?” (sounds as: SEAN) on the green board or more complex task by touching the letter “ ?” (sounds as: SAD') on the yellow board as shown in Figure (5). Those decisions were considered and counted as “the correct interactional decisions of the young user's manifested inner-interaction” based on four devolved principles. Table (1) illustrates the list of the four principles of the manifested inner-interaction and why using each principle (i.e., the rational of each principle). Table 1 The four main principles of evaluating the young user's manifested inner-interaction. The Digital Playground® used the four principles through a computer agent called AMA-GUIDE as the system to find out how often did the young users apply the principles of the adequate inner-interaction during the task level selection in points, that is; how much did the young users collect points during selecting the task level? However, whatever the young user decided to choose (simple/complex level), the Digital Playground® introduced the tasks in a sequence of simple, complex, simple, complex and so on and applied the proposed scores before introducing the actual task to measure the young users' innerinteraction during the task level selection (Figure 5). In the present study, we used the same computer agent called AMASCORE  where the Digital Playground® used it as the system to find out how often did the young users regulate themselves to answer the task (i.e., the degree of the young user's inner-interaction to answer). In other words, how much did the young users collect points during progression? Table (2) illustrates the proposed scores . Table 2 The AMA-SCORE system for scoring inner-interaction learning as a function of task precision. Specifically, the game automatically applied the AMA-SCORE to score the task performance as correct or incorrect for each task and related the final judgment of the task precision (correct/incorrect) to the choice of task level (simple or complex) that the user already made before presenting the actual task itself on the screen (Figure 7). Figure 7: The AMA-SCORE for measuring the inner-interaction as a function of task precision. During the AUC-Condition, the game was evaluated the task precision (correct/incorrect) only at the first user’s attempt to answer exactly as the KR-Condition despite the difference in the task feedback applied. Precisely, during the AUC-Condition (‘‘your answer is incorrect. Think again’’), the Digital-Playground® was only applied the AMA-SCORE system after the user’s first attempt to answer given the fact that both conditions have to be conditionally equivalent (i.e., applying the AUC task feedback does not mean that the Digital-Playground® waits the user to get the correct answer to apply the AMA-SCORE system). At both conditions, if the user did not answer during the task allotment time (60 seconds), the Digital-Playground® considered that as incorrect answer (exactly as the teachers followed in the classroom). Given the fact that the main differentiated factor among the users' spontaneous-interaction verbalization and the other verbalizations (compulsory-interaction/private speech, undesirable-interaction/social speech,), as concluded by Agina et al. [4,5], is that spontaneous-interaction/thinking-aloud should occur spontaneously and without any previous instructions/ encouragements to do so. Because there is no any special coding manual for spontaneous-interaction/thinking-aloud verbalization in the literature yet, all the utterances in the present study were considered as spontaneous-interaction/thinking-aloud verbalization for whatever the context of the utterance was. Table (3) illustrates some actual examples of the young users' verbalization during progression at both conditions. Table 3: Examples of the spontaneous-interaction/thinking-aloud utterances. As most recently reported [4,5], the Private Speech Coding Manual by Winsler et al. was fully inadequate to be used in the present study given the fact that it was essentially developed for the private speech (compulsory-interaction) but not for spontaneous-interaction/thinking-aloud verbalization. Technically, to avoid the external intervention after the session (i.e. to avoid using HHI with young users), the Digital-Playground® was attached with a computer agent called AMA-CHAT, which is a Friendly-Chat Questionnaire with the Princess and Superman that involved eight simple questions. Those questions were basically developed through closely cooperation with the teachers to enable the young users to describe their feelings and thoughts (i.e., their interaction/satisfaction). Practically, Superman opening the conversation by informing the young user that he and the Princess would like to chat with him about the game because he (the participant) showed a high degree of intelligence and could help to improve the game (regardless of his actual achievement and as a motivation for the young users to respond exactly as the teachers followed in the classroom). Superman asked the young user whether he would like to chat with them by touching the "OKAY" or "NOT-OKAY" sign (means that: agree or disagree respectively) in the middle of the screen as shown in Figure (8). Figure 8: The AMA-CHAT for the young users' response confirmation. If the young user agreed, the Princess first told the user that whenever he did not understand the point, he should touch her or Superman to repeat the explanation once again. For the next question, Superman asked the young user to touch the "OKAY" sign once again to chat with him about the game. When the young user agreed, Superman explained but not directly asked the question (exactly as the teachers follow in the classroom) and warn the young user to confirm his answer (agree/disagree) by touching the sign of agree/disagree. This signs are already so familiar and commonly used among the young users, as the teachers ensured, for the agreement and non-agreement. When the user either declined to chat, finished the questionnaire, or the time reached 16 minutes, which was the allotment time to finish the questionnaire based on the teachers' recommendation, the Princess moved the game to the reward session (Figure 9). Figure 9: The reward session. The reward session was the last session of the experiment where each child was rewarded with a piece of chocolate (Sinkers/ Kinder-Surprise). Those chocolates were the favorites among the participants as their teachers mentioned and usually used to reward the best in the classroom. Finally, the Princess and Superman thanked the participant and informed him that he did a very nice job with high performance and told him that when the room light comes on, he will find the chosen chocolate with the teacher in the meeting room. In contrast with the previous work that relied on the statistical tests to determine which condition is outperforming the other, the Digital Playground® was upgraded to make a final judgment between the two conditions in term of which condition is outperforming the other using special computer agent called AMA-POINT . Specifically, the computer becomes able to compare the overall performance between the two conditions through a new computer agent called AMA-POINT, which is the only ‘permitted agent to collect all the necessary data form the other agents AMA-GUIDE, AMA-SCORE, and AMA-CHAT. In more specific words, when the other agents scoring inner-interaction in regular points as a function of task level selection (AMA-GUIDE), inner-interaction as a function of task precision (AMA-SCORE), and young users' satisfaction during learning tasks (AMA-CHAT), the AMA-POINT started acting by scoring one AMA-POINT to the ‘winner’ condition (i.e., the condition that gained higher regular points will gain one AMA-POINT regardless the amount of the regular points) and finally calculating the result of each condition (i.e., how much this condition collected AMA-POINT?) to determine which condition is outperforming the other. Accordingly the AMA-POINT can be defined as "the extent the young users under X-Condition are outperforming the young users in Y-Condition as a real quantity in points ". Importantly, the data concerning the utterances was manually feeding to the agent AMA-POINT because it is currently unable to automatically make it. The Digital Playground® gathered data on factors such as the exact time the child started the game in milliseconds, the chosen task level, the actual task level, the level responsetime in milliseconds, the task precision's (correct/incorrect) response-time in milliseconds, the degree of the manifested inner-interaction as a function of the task level selection and as a function of the task precision generated by the computer agents AMA-GUIDE and AMA-SCORE respectively, and the answers of the questionnaire that generated by the computer agent AMA-CHAT. For the sake of the accuracy, the video recording for all young users was reviewed to ensure that they were acting perfectly till the end of the experiment. The school has a special experimental room ready for research with young users and their teachers. This room was usually located in a quiet corner and involved a child-sized chair, an external 17-inch touch-screen (to avoid any possible coordination problems for the young users) connected to a laptop computer, and two hidden portable video cameras. The first camera captured the entire environment, and the second offered a clear view of the task on the screen and the young user’s face. An extra small microphone was connected to the second camera for audio recording. The young users were kept unaware of the cameras and the microphone to avoid a problem of splitting attention that could lead to undesirable cognitive processes. Each young user attended a five-minute welcome session in the preschool’s meeting room but did not receive training on how to use the system. The young users were told that the game required a smart player to complete the tasks and that they should follow the instructions given by the computer. They were also told that neither their teacher nor the experimenter would tell the answers even if the teacher presented. All sessions were held in the morning at 9:30 AM to avoid differences due to fatigue. The actual experiment ran with two young users of each group per day (first two young users from the AUC-Condition and then two young users from the KR-Condition) and the entire experiment required ten days to accomplish. The present study was conducted to shed a new light on the effect of the task feedback on young users' interaction behavioral development based on the previous work by Agina, et al. . The effect was investigated through exploring the effect of the computer's Answer-Until-Correct (AUC-Condition) versus computer's Knowledge-of-Result (KR) on young users’ interaction behavioral development during learning tasks through what currently known as Aginian’s methodology (Aginian's studies). First, the results that generated by the Digital Playground® will be demonstrated and, second, the necessary statistical tests will be used to verify the reliability of the Digital Playground® results. The research question addressed had to do with the difference in overall performance between the two conditions in terms of better, worst or the same on AUC-Condition compared to KRCondition. The computer's agent AMA-POINT (Table 4) showed that the young users in KR-Condition is outperforming the young users in AUC-Condition, indicating—as not expected—that children under AUC-Condition were outperforming children under KR-Condition in overall performance. Table 4: The final judgment between the two conditions (AUC-Condition vs. KR-Condition) by the computer's agent AMA-POINT. Statistically, the effect of AUC-Condition versus KR-Condition on the scores for task performance related to task level (AMAGUIDE) and task precision (AMA-SCORE) was performed by ANOVA (Tables 5 and Table 6). The result revealed no significant condition effect, F(4.37) = 3.15, p < .01, η2 = .04, indicating—as not expected—that the young users under AUC-Condition were outperforming the young users under KR-Condition in overall performance. Table 5 The young users' responses in milliseconds as generated by the game, by condition. Table 6: The effect of AUC vs. KR task feedback on the young users' inner-interaction, by condition. The AMA-POINT (Table 1) showed that, despite the young users in AUC-Condition produced more verbalization intensity than the young users in KR-Condition; the KR-Condition was more ‘verbalizers’ during the task level selection than the AUCCondition. The game also showed the details of the verbalizations in occurrences, proportions, and point as shown in Table (3), which is also showed that there was no significant difference between the two conditions when the young users think and talk while acting alone in which the AMA-POINT confirmed the hypothesis that the young users in AUC-Condition produced more verbalizations than the young users in KR-Condition despite the slight difference (52% and 48% for AUC-Condition and KR-Condition respectively). The Kappa scores, however, indicated poor agreement between the two conditions (j < .20) in verbalization when they acting alone with computer, as a nonhuman external regulator, that used the AUC versus KR during learning tasks. Overall, the AMA-POINT showed that the young users in KRCondition were slightly outperforming (only two AMA-POINT) the young users in AUC-Condition (only one AMA-POINT), indicating—as not expected but as the AMA-POINT generated— that the young users in KR-Condition were outperforming the young users in AUC-Condition. This result was already confirmed by ANOVA as well in the overall performance (Section 4.1). The AMA-POINT (Table 1) showed that the young users in KRCondition were more inner-interactors during the task level selection because they gained only one AMA-POINT. The detailed result of the AMA-POINT was generated by the game itself in occurrence, proportion, and the difference in regular points that showed the extent the young users in both conditions applied the AMA-GUIDE during the task level selection (Table 7). The result showed that the young users in KR-Condition were slightly outperforming (51%) in manifesting inner-interaction as a function of the task level selection than the young users in AUCCondition (49%). *Note: the “Principle-0” holds the number of the occurrences of the young users' inner-interaction that the game was unable to understand. Table 7: The extent the children applied AMA-GUIDE as generated by the game, by group. To statistically verify that, an ANOVA was performed, and after controlling the task level selection, the result revealed very slightly significant effect, F(3.89) = 4.11, p > .05, g2 = .05, indicating—as not expected but as the AMA-POINT generated— that the young users in KR-Condition were slightly outperforming the young users in AUC-Condition in manifesting inner-interaction as a function of the task level selection (Table 4). Therefore, an ANCOVA was performed with the condition (boys versus girls) to determine the effect of the gender (as a covariant variable) on the young users' manifested inner-interaction as a function of the task level selection whereas the quantitative explanatory variables were the young users' task level selection and age. The result revealed no significant condition effect, F(3.73) = 1.83, p > .05, indicating that the participants' gender had no effect on the manifested inner-interaction as a function of the task level selection. The correlation between the young users' task level selection and applying the AMA-GUIDE was (r = .01, ns.) and (r = .01, ns.) among the young users in AUC-Condition and KRCondition respectively. Statistically, The Kappa scores indicated poor agreement (j < .20) between children in AUC-Condition and KR-Condition in applying each principle of the AMA-GUIDE during the task level selection. The AMA-POINT, as illustrated in (Table 1), showed that the young users in AUC-Condition were more inner-interactors during the task precision because they gained only one AMAPOINT. The detailed result of the AMA-POINT was generated by the Digital-Playground® itself in occurrence, proportion, and the difference in regular points that showed the extent the young users in both conditions applied the AMA-SCORE during the task level selection (Table 8). The result showed that the young users in AUC-Condition were slightly outperforming (956 points: 51%) in manifesting inner-interaction as a function of the task level selection than the young users in KR-Condition (953 points: 49%). Table 8: The extent the young users applied AMA-SCORE as generated by the game, by group. To statistically verify that, an ANOVA was performed, and after controlling the task precision, the result revealed slightly condition effect, F(3.95) = 5.54, p > .05, g2 = .06, indicating—as expected and as the AMA-POINT generated—that the young users in AUC-Condition were outperforming the young users in KR-Condition in manifesting inner-interaction as a function of the task precision. Because gender had no significant condition effect on the manifested inner-interaction during the task level selection, there was no need to run it once again with the task precision because the result will be the same even if the numerical result is different. The correlation between the young users' task precision and applying the AMA-SCORE was (r = .02, ns.) among the young users in AUC-Condition and (r = .01, ns.) in KR-Condition. The Kappa scores indicated poor agreement (j < .20) between the young users in AUC-Condition and KR-Condition in applying each principle of the AMA-SCORE. In contrast with the previous Aginian’s studies, the Digital- Playground® became able to instantly make a judgment about the more interacted condition during progression (i.e., during learning tasks). Table (9) showed that the young users in the KR-Condition were more interacted (two AMA-POINT) than the young users in the AUC-Condition (zero AMA-POINT) in which the AMA-POINT scored one credit to the KR-Condition. In sum, the overall result, indicating that the young users in KR-Condition gained a higher degree of interaction than the young users in AUC-Condition. The two different credits were concerning the third and eighth questions where the young users in the KR-Condition were more interacted with the level of the tasks and more interacted to act alone without the need of their real teacher to be present with them when they acting alone with the isolated, computer-based learning environment. Table 9: The effect of the computer’s intervention on young users' satisfaction, by group. The present study is an extension of the study by Agina, et al. to explored the effect of the computer's task feedback AUC versus computer's task feedback KR on the young users interaction behavioral development, which is the subject that basically introduced by Agina, et al. [4,5]. Consequentially, the present study uses the same methodology, method and material, participants, procedure and results. However, the discussion and conclusion are almost different given the fact that the present study was mainly conducted to explore the effect of the computer's AUC versus computer's KR task feedback on the young users' interaction behavioral development. Importantly, this section is not going to discuss whether the present study is consistent or inconsistent with the previous work as it is focusing on the reflection upon the experimental design, describing the main implications of the results, explaining the most significant limitations that the future work should remedy, and eventually stating the recommendations in terms HMI. That is because the nature of the present study is to be inconsistent with the previous work because of the computerized methodology used. Overall, the results from the present study show that the young users in the KR-Condition outperform the young users in AUCCondition where the significant effect can be understood through the new computer agent AMA-POINT, which clarifies the difference between the two conditions in credits and as a real quantity in points. In terms of HMI, this result has never seen before. However, despite the overall results generated by the computer agents AMA-POINT, AMA-GUIDE, AMA-SCORE and AMA-CHAT are not confirmed the proposed hypothesis that the young users in AUCCondition will outperform children in KR-Condition, the result of the statistical ANOVA is fully consistent with the game’s results that, to a great extent, proves the reliability and validity of the proposed measurements of the young users’ inner-interaction as a function of the task level selection and as a function of task precision as well as the young users' interaction as a real quantity in points. This result has never seen before in HMI that the interaction can be measured during progression without any sign of HHI. Are Vygotsky's- and Piaget's view versus innerinteraction? On one hand, the Vygotskyian’s view of self-regulation/innerinteraction (1978; 1986) is that inner-interaction is behavioral, appears after and as a result of regulation by others (i.e., as a result of learner-Instructor interaction) in a specific task and promoted by external regulators (i.e., HHI). On the other hand, Piaget’s view of inner-interaction  is that inner-interaction is psychological and promoted by giving children extensive opportunities to make choices and decisions. In terms of HMI, however, self-regulation and inner-interaction, as reported by Agina, et al. [4, 5], are different terminologies used to describe the same phenomenon given their identical mechanism (i.e., how it occurs? and how it works?). This result is fully is confirmed by the present study. From a technical point of view, however, the mechanism’ of the Aginian’s methodology (Aginian's studies), by nature, does not confirm Vygotsky’s view of self-regulation (inner-interaction) and that is because the participants do not receive any regulation before, during, or after progression. Simultaneously, the Aginian’s methodology does not also confirm Piaget’s view of innerinteraction and that is because the computer's feedback (AUC and KR alike) are eventually a kind of external regulation despite it is delivered by a nonhuman’s regulator (i.e., computer through the Digital-Playground®). This, in turn, makes the results of the present study or, at least the most, will be inconsistent with the previous work and that is the main reason why the present study does really pay attention to the consistency/inconsistency with the previous work given the fact that ultimate goal is to show to the powerful effect of the computerized methodology on the young users' behavioral interaction development. The results of the present study provide evidences that the relationship between the young users' spontaneous-interaction (thinking aloud) verbalization and the manifested innerinteraction (self-regulation) is inverse relationship, which is the result that has never seen before in the literature! This is very clear because the young users in AUC-Condition are more verbalization productive and, simultaneously, gain a lower degree of inner-interaction in overall performance. While this result has never seen before and supports the Aginian’s previous studies that spontaneous-interaction (i.e., thinking aloud) should occur spontaneously without any previous instruction to do so (i.e., without any sign of HHI), it is really surprising that the previous work still rely on the same three common thinking aloud protocols, which are concurrent think aloud, retrospective thinking aloud, and constructive interaction, for gathering the thinking aloud verbalization. The previous work relied on that without realizing the fact that all of those protocols are already controlled through and by HHI, which is already detrimental as thinking aloud (spontaneous-interaction) should occur spontaneously and without any previous instruction to do so or any sign of HHI before/ during/after the progression. This implication leads strongly the future work to seriously taking into account the reinvestigation of the thinking aloud protocols in terms of HMI and to develop such a new protocol or a number of protocols given the fact that the young users are already providing evidences that they can think and talk while acting alone with a computer. From an analytical point of view, however, there is a sensitive implication in the present study that has to be seriously taken into account and consideration in the future work concerning the context and content of spontaneous-interaction (i.e., thinking aloud). Precisely, the content of the young users' verbalization, per se, in the present study is directed and guided either by the computer's task feedback AUC or KR despite the fact that all the verbalization in both conditions is a pure thinking aloud (i.e., spontaneous-interaction) because the young users were not asked to verbalize their thinking by any means before, during, or after progression. In more simple words, the content of the thinking verbalization of the AUC-Condition and KR-Condition is respectively guided by the context of the AUC, itself, and KR, itself, in that it can be said ‘‘this is an AUC-based spontaneousinteraction’’ and ‘‘that is a KR-based spontaneous-interaction’’. This implication leads to realize the fact that if the interaction is naturally guided by the current process like AUC or KR in the present study, then why do not utilize this powerful feature to guide the young users to spontaneously verbalizing their actual thinking/interaction about such important developmental problems and issues such as their relationship, for instance, with their parents, teachers, and classmates, and why do not utilize it to spontaneously enable young users to express the most significant problems they face in their social/academic/ personal life (i.e., it can be simply said: this is parents-based spontaneous-interaction, this is teacher-based spontaneousinteraction and so on. Of courses, each of those subjects requires special set of tasks that have to be very carefully and accurately developed). This implication, in turn, leads the future work to seriously reinvestigate the current thinking aloud protocols used in the literature when young user, especially at an early age, are conducted to be the end-users to think and talk while acting alone. Consistent with this conclusion, the present study can be considered as the first cultivated seed of developing the ‘‘Spontaneous-Interaction Coding Manual’’ given the fact that the literature, up to date, still has no such a manual yet that the researchers may use to identify and classify the verbalization and elicitation of the spontaneous-interaction. Nonetheless, the present study still ‘captured’ by the game’s inability to integrate the amount of inner-interaction (selfregulation) for each young user during each single task as a real and unique quantity (i.e., from the task level selection to the task precision) in which the integrated quantity of each condition can be mathematically calculated. Technically, there is another problem concerning the new agent AMA-POINT in which the data of the utterances gathered has to be manually entered to the Digital-Playground®. This is because AMA-POINT is currently unable to automatically make it. Indeed, we are not going to work on the technology of the speech recognition as we already have an alternative to make it based on the fact that the young users can act alone with the computer in which this technique has to be first tested and then evaluated as well (currently this technique is under construction). Another important limitation is that the Digital Playground® does not consider the effect of the number of the attempts that the young user spent to answer the task during the AUC-Condition. Mathematically, this point might be very useful in scoring the young users' inner-interaction in more specific calculation. - What difference it makes when using the term private speech, task related-speech, or compulsory-interaction? - What difference it makes when using the term social speech, task unrelated-speech, or undesirable-interaction? - What difference it makes when using the term thinking aloud or spontaneous-interaction? - What difference it makes when using the term selfregulation or inner-interaction? In other simple words, a scientific revolution that may help the developmental process of our children in all terms will not raise as long as we just play with English terminologies to describe the same phenomenon. As long as we do not change our thinking, we will not help our children as we will just repeat what already available in the literature! We would like to thank the company of MT5IT (Tripoli/ Libya) for funding this research. We also thank the preschool administrations for their support with very special thanks to the young heroes—the preschool young users—and their parents and teachers, whose cooperation and advice were invaluable. Rossi D, van Rensburg H, Beer C, Clark PD, Harreveld B (2013) Learning interactions: A cross-institutional multi-disciplinary analysis of learner-learner and learner-teacher and learner-content interactions in online learning contexts. dehub Report Series; University of New England. Dewey J (1916) Democracy and education. New York, NY: Macmillan. Dewey J (1938) Experience and education. New York, NY: Collier Macmillan. Agina AM, Kommers PAM, Heylen D (2015a) Towards Understanding Human-Media Interaction: The Effect of Human's Absence vs. Computer's Voice on Detecting Young Users’ Behavioural Interaction Development Through a Digital-Playground®. Danish Science Journal 2: 51-69. Agina AM, Kommers PAM, Heylen D (2015b) Towards Understanding Human-Media Interaction: The Effect of Computer's- vs. Teacher's Presence and Voice on Young Users’ Behavioural Interaction Development through a Digital-Playground®. Int J Sch Cog PsycholS2:011.
de Kok I, Heylen D (2012) Analyzing nonverbal listener responses using parallel recordings of multiple listeners. Open access, Springerlink. Clark HH (1996) Using language. Cambridge University Press, Cambridge. Heylen D, Bevacqua E, Pelachaud C, Poggi I, Gratch J, Schröder M et al. (2011) Generating listening behavior. In: Cowie R, Pelachaud C, Petta P (eds) Emotionoriented systems. The humaine handbook, Springer, London, pp 321–347. Fernyhough C, Fradley E (2005) Private speech on an executive task: Relations with task difficulty and task performance. Cognitive Dev 20: 103–120. Ericsson KA, Simon HA (1993) Protocol analysis: Verbal reports as data (2nd ed.) Cambridge, MA: MIT Press. Girbau D (2002) A sequential analysis of private and social speech in children’s dyadic communication. The Span J Psychol5: 110–118. Muraven M (2010) Building self-control strength: Practicing self-control leads to improved self-control performance. J ExpSocPsychol 46: 465–468. Tang CM, Bartsch K, & Nunez N (2007) Young children’s reports of when learning occurred. J Exp Child Psychol 97: 149–164. Winsler A, Abar B, Feder MA, Schunn CD, Rubio RA (2007) Private speech and executive functioning among high-functioning children with autistic spectrum disorders. J Autism DevDisord 37: 617–1635. DeVries R, Zan B (1992) Social processes in development: A constructivist view of Piaget, Vygotsky, and education. Paper presented at the annual meeting of the Jean Piaget Society, Montreal, Quebec, Canada. Flavell JH (1966) Le langageprivé. Bulletin de Psychologie 19, 698–701 [Originally presented at the Annual Meeting of the American Speech and Hearing Association, San Francisco, November 1964]. Agina AM (2012a) "Who vs. Whom AND Where Should We Go Through? ": A Reflection Towards Clarifying the Effect of Media and Entertainment on Children's Development for Future Research. Computers in Human Behavior, 28(2012) 1083–1090. Agina AM (2012b) The Effect of Nonhuman's External Regulation on Young Children's Self-Regulation To Regulate Their Own Process of Learning. Comput Hum Behav, 28 (2012) 1140–1152. Agina AM (2012c) The Effect of Nonhuman's External Regulation on Young Children's Creative Thinking during Learning Mathematical Tasks. Comput Hum Behav, 28 (2012) 1213–1226. Agina AM (2014) An Analytical Reflection towards Understanding the Effect of Children's Behavioral Regulation (CBR) on Children's Behavioral Nutrition (CBN) Through Computer-based Edutainment Environments. J Child AdolBehav 2: 1000166. Agina AM (2015) Critical Excerpts (Critiques) On Children’s Behavioral Development (CBD). J PsycholAbnorm Child 4: e104. Agina AM, Kommers PAM (2008) The Positive Effect Of Playing Violent Games On Children’s Self-Regulation Learning. IADIS Multi Conference on Computer Science and Information Systems (MCCSIS 2008) Proceedings.Amsterdam, the Netherlands (2008). Agina AM, Kommers PAM, Steehouder M (2011a) The Effect of the External Regulator’s Absence on Children’s Speech Use, Manifested Self-regulation, and Task Performance during Learning Tasks. Comput Hum Behav 27: 1118–1128. Agina AM, Kommers PAM, Steehouder F (2011b) The effect of nonhuman's versus human's external regulation on children's speech use, manifested self-regulation, and satisfaction during learning tasks. Comput Hum Behav 27: 1129-1142. Agina AM, Kommers PAM, Steehouder F (2011c) The effect of the nonhuman external regulator’s answer-until-correct (AUC) versus knowledge-of-result (KR) task feedback on children’s behavioral regulation during learning tasks. Comput Hum Behav 27: 1710–1723. Agina AM, Kommers PAM, Steehouder F (2011d) The effect of nonhuman’s external regulation on detecting the natural development process of young children’s self-regulation during learning tasks. Comput Hum Behav 27: 1724–1739. Agina AM, Kommers PAM, Steehouder F (2012c) The effect of nonhuman’s external regulation on children’s responses to detect children with developmental problems (DP) associated with the natural development of self-regulation during learning tasks. Comput Hum Behav, 28: 527–539. Agina AM, Tennyson RD (2012d) Towards Understanding the Positive Effect of Playing Violent Video Games on Children’s Development. , Procedia - Social and Behavioral Sciences, 780–789. Agina AM, Tennyson RD, Kommers PAM (2013) Understanding children’s private speech and self-regulation learning in Web 2.0: Updates of Vygotsky through Piaget and future recommendations. In P. Ordóñez de Pablos, H.O. Nigro, R.D. Tennyson, S.E. González Cisaro, & W. Karwowski (Eds. ), Advancing information management through semantic Web concepts and ontologies. Hershey, PA: IGI Global. Swan K (2003) Learning effectiveness online: What the research tells us. In J. Bourne & J. C. Moore (Eds. ), Elements of quality online education, practice and direction (pp. 13–45). Needham, MA: Sloan Center for Online Education. Garrison DR, Cleveland-Innes M (2005) Facilitating cognitive presence in online learning: Interaction is not enough. Am J Distance Educ 19: 133148. Moore MG, Kearsley G (1996) Distance education: A systems view. New York, NY: Wadsworth. Moore MG (1989) Three types of interactions. Am J Distance Educ, 3: 1-6. Anderson T (2003) Modes of interaction in distance education: Recent developments and research questions. In M. G. Moore & W. G. Anderson (Eds. ), Handbook of distance education (pp. 129-144). Mahwah, NJ: Erlbaum. Belanger F, Jordan DH (2000) Evaluation and implementation of distance learning: Technologies, tools, and techniques. Hershey, PA: Idea Group. McIsaac MS, Blocher JM, Mahes V, Vrasidas C (1999) Student and teacher perceptions of interaction in online computer-mediated communication. Educ Media Int, 36: 121-131. Yukselturk E, Yildirim Z (2008) Investigation of interaction, online support, course structure and flexibility as the contributing factors to students' satisfaction in an online certificate program. Educational Technology & Society, 11: 51-65. Northrup P, Lee R, Burgess V (2002) Learner perceptions of online interaction. Paper presented at ED-MEDIA 2002 World Conference on Educational Multimedia, Hypermedia & Telecommunications, Denver, CO.
Bray E, Aoki K, Dlugosh L (2008) Predictors of learning satisfaction in Japanese online distance learners. Int Rev Res Open Dis 9: 1-24. Tuovinen J (2000) Multimedia distance education interactions. Educ Med Int 37: 16-24. Bishop MJ, Cates WM (2001) Theoretical foundations for sound's use in multimedia instruction to enhance learning. Etr&D-Educ Tech Res 49: 5-22. Mason R, Kaye A (1990) Toward a new paradigm for distance education. In L. M. Harasim (Ed. ), Online education: Perspectives on a new environment (pp. 15-38). New York, NY: Praeger. Kerka S (1996) Distance learning, the internet, and the world wide web. Chejlyk S (2006) The effects of online course format and three components of student perceived interactions on overall course satisfaction. Dissertation Abstracts International 67. Keeler LC (2006) Student satisfaction and types of interaction in distance education courses. Dissertation Abstracts International 67. John-Hattie J &Timperley H (2007) The power of feedback. Rev Educ Res, 77: 81–112. Gottfried AE, Fleming J, Gottfried AW (1994) Role of parental motivational practices in children’s academic intrinsic motivation and achievement. J EducPsychol 86: 104–113. Kluger AN, DeNisi A (1996) The effects of feedback interventions on performance: A historical review, a meta-analysis, and a preliminary feedback intervention theory. Psychological Bulletin 119: 254–284. Daugherty M, White C, Manning B (1994) Relationships among private speech and creativity measurements of young children. Gifted Child Quart 38: 21–26. Bernardini S (1999) Using think-aloud protocols to investigate the translation process: Methodological aspects. Bologna: University of Bologna. Krahmer E, Ummelen N (2004) Thinking about thinking aloud: A comparison of two verbal protocols for usability testing. Netherlands: Tilburg University. Jááskeláinen R (1999) Tapping the process: An explorative study of the cognitive and affective factors involved in translating. Joensuu: University of Joensuu. Fuson KC (1979) The development of self-regulating aspects of speech: A review. In G. Zivin (Ed. ), The development of self-regulation through private speech (pp. 135–217). New York: Wiley. Papastergiou M (2009) Digital game-based learning in high-school computer science education: Impact on educational effectiveness and student motivation. ComputEduc 52: 1–12. Chen HR, Wigand, Nilan MS (1999) "Optimal Experience of Web Activities" Comput Hum Behav 15: 585-608. Vorderer P, Bryant J (2006) Playing Video Games: Motives, Responses, and. Consequences. Mahwah, N.J.: Lawernce Erlbaum Associates Publishers. Ke F, Grabowski B (2007) Gameplaying for math’s learning: cooperative or not? Brit J EducTechnol 38: 249-259. Oliver R, Herrington J (2001) Teaching and learning online: A beginner's guide to elearning and e-teaching in higher education. Perth, WA: Centre for Research in Information Technology and Communications. Raybourn EM, Bos N (2005) Design and evaluation challenges of serious games. In: Proceedings of ACM CHI 2005 Conference on Human Factors in Computing Systems, pp. 2049-2050. Kiili K (2005). Digital game-based learning: Towards an experiential gaming model. Internet High Educ, 8: 13-24. Subrahmanyama K, Patricia G, Krautc R, Gross K (2015) The impact of computer use on children's and adolescents' development. J ApplDevPsychol 22: 7-30. Ke F (2014) An implementation of design-based learning through creation educationsl computer games: A case study on mathematics learning during design and computing. ComputEduc 73: 26-39. Ariffin MM, Oxley A, Sulaiman S (2014) Evaluating Game-based Learning Effectiveness in Higher Education. Procedia – Social and Behavioral Science, 123: 20-27. Konstantina C, Virvou M (2013) Student modeling approaches: a literature review for the last decade. Expert SystAppl 40: 4715–4729. Rodríguez R, Ayala G (2012) Adaptivity and Adaptability of Learning Object’s Interface. Int JComputAppl 37: 1. Vygotsky LS (1978) Mind in Society, ed. M. Cole, et al., Cambridge, MA: Harvard University Press. Vygotsky LS (1986) Thought and Language, ed. A. Kozulin, Cambridge, MA: MIT Press. Winsler A, Fernyhough C, McClaren EM, Way E (2005) Private speech coding manual. Unpublished manuscript.George Mason University, Fairfax, VA, USA. Piaget J (1932/1965) The moral judgement of the child. London: Free Press.